Should you buy a Sales Professional or a Sales Enterprise user license for Microsoft Dynamics 365? Here is a summary of the differences between these two license types. Our customers cross both editions, however the ones that fall into the Professional category are very happy they are now only paying for the features they need. *3rd Party solutions added from AppSource do not count against this limit. Limit to size of 3rd party solution. See: https://dynamics.microsoft.com/en-us/pricing/sales/ for more details. The team at Crowe CRM has spent countless hours studying the licensing details of Microsoft Dynamics 365 so you don’t have to. 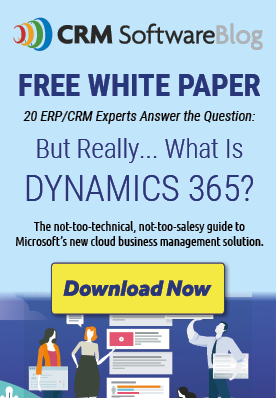 What Microsoft Dynamics 365 license types do my sales people need? Can we get a combination of license types for different roles? Can we easily move up or down in license types? These features that are not available in Professional, what are they and do we need them? When could it cause problems to have a limited number of customizations and forms? What do the differences in “Real time sales reports and dashboards” in Professional vs Enterprise mean for my company? Are you ready to evaluate Microsoft Dynamics 365? Let Crowe CRM help you determine the right Microsoft Dynamics 365 licensing for your company. Contact us today. Check out our offer “Moving CRM to Dynamics 365: 3-Hr Assessment”. When is $100,000 a bargain? When it completely transforms your higher education ERP. 2 Great Tips for Mastering Microsoft Dynamics CRM!